When you operate aircraft in remote places, difficulties like gauges not working correctly or other engineering problems can be quite significant. This week there was a chance that MAF in Timor-Leste would have no aircraft able to fly! One aircraft was scheduled for its regular fifty hour checks, when a gauge on the other aircraft began to malfunction. Procedures for managing this fault declare that if this part is faulty, you can continue to fly the plane for only three days, as there are other gauges that give the same information to the pilot, but after those three days, the plane must be grounded until the gauge can be fixed or replaced. When you operate aircraft in remote places, difficulties like gauges not working correctly or other engineering problems can be quite significant. While MAF keeps a number of parts in store at each base there is not a replacement for every part. So a simple faulty gauge suddenly has the possibility of interrupting the ability to fly an aircraft for several days until an engineer can arrive, usually from an overseas location, with a replacement part and the expertise to fix it! But thankfully in this situation, help was already on the way! MAF Engineer, John Hermanus, who usually is based in MAF’s Support Base in Mareeba was already on his way to Dili, as our other aircraft VH-MQO was scheduled for regular maintenance. 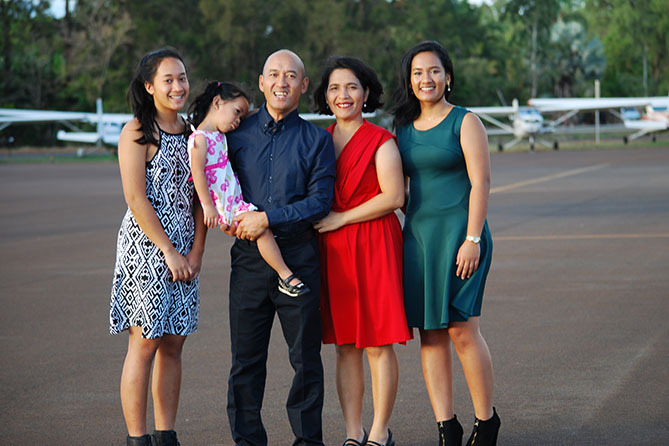 John now serves as an important part of the MAF team based in Mareeba in Queensland, Australia. 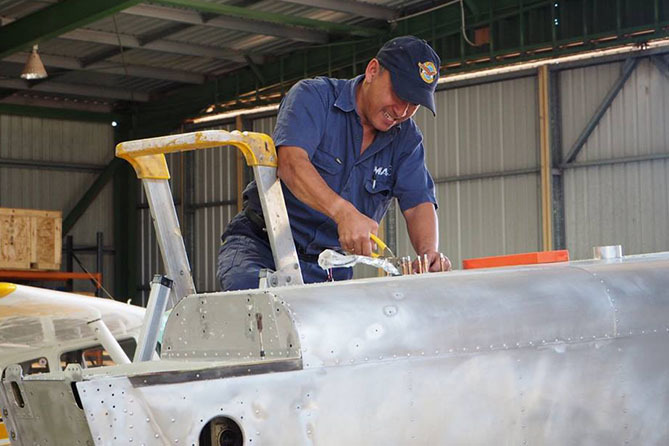 MAF Mareeba has a critical role in supplying the engineering care for all of the MAF aircraft in the MAF Asia Pacific Region, which includes Timor-Leste, Arnhem Land, Papua New Guinea and Bangladesh. 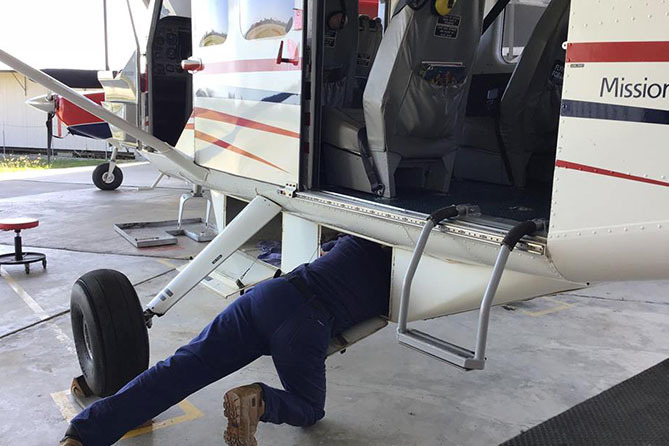 Keeping aircraft flying takes a lot of administration and careful maintenance. Engines must be changed over every 2,000 hours which requires equipment that can only be done in Mareeba. Replacement parts must be ordered, stored and recorded for their scheduled change or when they are faulty. This is the level of detail that is needed to ensure our MAF aircraft are operating as safely and efficiently as possible. 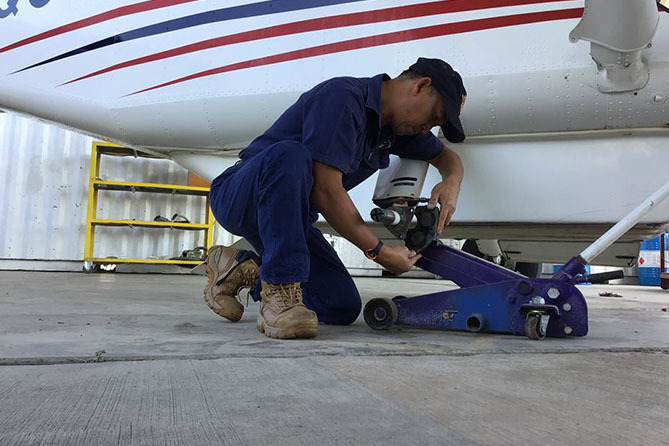 While pilots do daily checks on the aircraft each day before they fly, this extra level of aircraft checking and maintenance can only be carried out by engineers, individuals trained to do this role over many years. John or one of his fellow engineers from Mareeba visit Timor-Leste several times each year. Their visits are usually booked to conduct regular maintenance checks, but they also come as needed when problems arise. 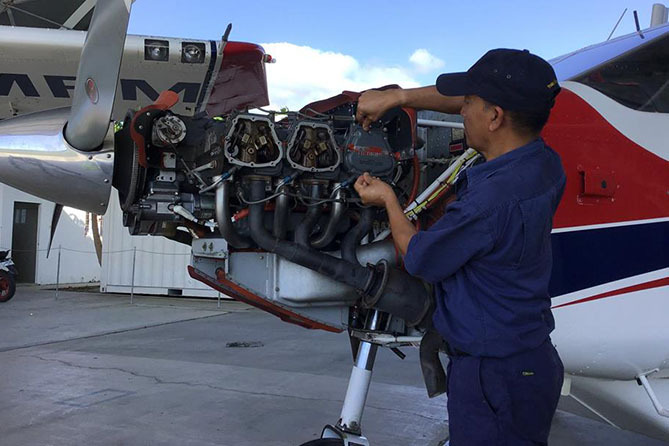 In recent years, engineers have visited the MAF Timor-Leste Programme to fix a fuel tank leak or to assess the damage caused to the propeller when a rock hit it on landing. On this visit to Dili to check VH-MQO needs to ensure that all components of the aircraft are working correctly. He has a strict list to follow and a tight time frame to complete everything thoroughly, just five days! 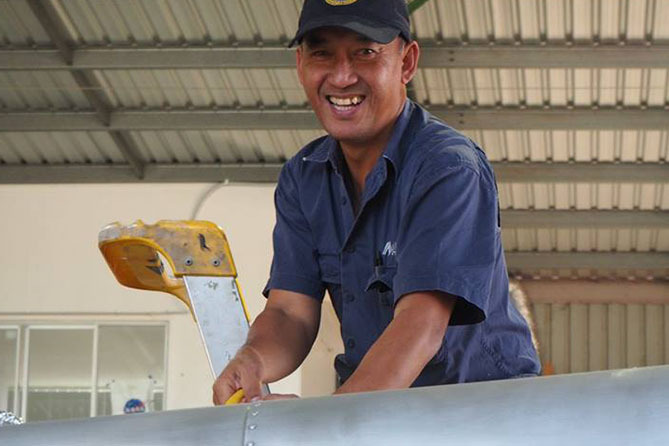 The pilots and other MAF Timor-Leste staff assist where they can, removing the seats from the plane or the panels from the engine bay. MAF is truly an international organization! You may see lots of photographs of the pilots and planes flying in places like Timor-Leste, Papua New Guinea and South Sudan, but rarely do you see the many people behind the scenes working hard to keep those aircraft in the air assisting the poor and isolated people of this world. The work that MAF engineers, like John do can be tiring and difficult, it means time in another country away from their families for a week or more and a lot of travel. But the result is evident, whenever we see our MAF aircraft providing a medevac flight, saving people’s lives by providing emergency transportation, we know that this can only happen because of our MAF staff like John the engineer, who work in their field of expertise to keep our aircraft flying safely.